We have improved the method for creating links to uploaded files in Informetica by adding a link tool to files within the media library. Link directly to an image, video, Flash, or audio file that you have uploaded to Informetica. The link is presented to your end users for download instead of the media playing on the Informetica page. Navigate to the page where you want the file to appear. Position the cursor on content editor page where you want the file to be placed. Click the link icon next to the video in your media library. This feature is available on your preview sites now and will be available on live sites on Wednesday, February 24th. 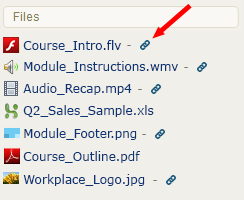 You can still embed the file on the page by clicking on the file name instead of the insert link icon.